WE BELIEVE the BIBLE is the inspired Word of God and is our infallible guide in matters pertaining to conduct and doctrine (2 Timothy 3:15-17). WE BELIEVE in the one true GOD who has revealed and manifested Himself in three persons: Father, Son and Holy Spirit (1 John 5:7; Matthew 28:19). WE BELIEVE that it is impossible to come to God the Father by any other means than through THE SON, the Lord Jesus Christ and His shed blood (John 14:6; Acts 4:12). WE BELIEVE that through ADAM’S FALL, sin came into the world, and man’s first steps to the New Birth experience are repentance and belief in Jesus Christ as Lord and Savior (Romans 5:12-15; Mark 1:15). WE BELIEVE in WATER BAPTISM by immersion in the name of the Father, Son and Holy Ghost (Matthew 28:19; Acts 8:36-39). WE BELIEVE in the BAPTISM OF THE HOLY GHOSTas a separate and distinct experience from the New Birth experience. We believe that it is a necessary, vital experience for empowerment and service. (Acts 1:4-5, 8; Luke 24:49; Acts 8:12, 15-17). WE BELIEVE in thedoctrine of SANCTIFICATIONas a definite, progressive work of grace, beginning at the time of the New Birth and continuing until the consummation of salvation at Christ’s return (Hebrews 12:14; 1 Thessalonians 5:23; 1 Corinthians 1:30; 2 Corinthians 3:18; Philippians 3:12-14). WE BELIEVE that speaking in TONGUES is the initial evidence that accompanies the baptism with the Holy Ghost (Acts 2:4; Acts 10:44-46; Acts 19:1-6). 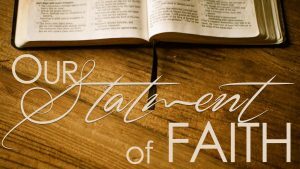 WE BELIEVE it is essential that every believer lay a foundation of BIBLICAL TRUTHand experience upon which he builds his life (Hebrews 6:12; John 8:47). WE BELIEVE the TITHE of our earnings is holy unto God (Malachi 3:8; Hebrews 7:4-10). WE BELIEVE the nine GIFTS OF THE SPIRIT should be and must be operative in the church to enjoy the fullness of God (1 Corinthians 12:11). WE BELIEVE in the doctrine of the LAYING ON OF HANDS for confirmation, ordination, impartation, and ministry of healing to the sick (Acts 13:1-3; 1 Timothy 4:14; Hebrews 6:2; Mark 16:18; Acts 8:17). WE BELIEVE that HEALING is a part of the atoning work of Jesus Christ and that it belongs to every believer today (spiritually, mentally, physically) (Isaiah 53:5; Matthew 8:17; 1 Peter 2:24). WE BELIEVE that Jesus continues to bestow all five of the MINISTRY GIFTS (Apostle, Prophet, Evangelist, Pastor, Teacher) to His body. They are operative today for the perfecting of the saints to do the work of the ministry (1 Corinthians 12:28; Ephesians 4:7-12). WE BELIEVE in WOMEN IN MINISTRY; that God’s ministry and spiritual gifts are given without regard to ethnicity, social class or gender…he gave gifts to men (Greek: anthropos; human being) (Ephesians 4:1-12; Galatians 3:26-28). WE BELIEVE in the imminent RETURN OF JESUS CHRIST and bodily rapture, or resurrection, of the church (Acts 1:11; 1 Thessalonians 4:13-17). WE BELIEVE that APOSTLES, or apostolic anointing is present and operative in the earth today to prepare and send forth believers to fulfill the Great Commission (1 Corinthians 12:28; Ephesians 4:11-13; Matthew 28:19-20). WE BELIEVE in a literal HEAVEN AND HELL; those who physically die in Christ will immediately go to be with Him. Those who die without Christ will be eternally lost (Luke 16:19-31; Matthew 5:22; 10:28; 2 Corinthians 5:6-9).